The highlight of this visit was the encounter with the hippopotamus at the Mare aux Hippopotames. The border formalities were very quick and it wasn't long before we reached the first peage point. Here we go again, we thought - another tourist tax. I was wrong - it is a tax for everyone and is very cheap. All main roads in Burkina are divided into sections and it is necessary to pay a small fee (about 40p) for each section. There are only about ten sections and the roads are so good that we would encourage the system. We made our way to Lac Tengrela for an early camp. We had hoped for a relaxing afternoon at the lakeside but then two coach loads of tourists turned up for rides in pirogues. They were more interested in our tent than the lake and also gave us news of Noel and Sally. The travellers grapevine is incredible. The coaches drew the locals and when the coaches departed they left us with the twenty or so children watching me make dinner. The plantain curry is now a favourite. The recipe is in the food section below but take note that it is my recipe and I have copyright - all acknowledgements to me please! We offered five of the children some pieces of coconut and put a bowl full in front of them. That was a bad move because they started grabbing and pushing and pulling on the bowl. It was incredible - within about half a second the lot had gone. They were like a load of vultures. We heard on the radio of the death of King Hassan 2 of Morocco. We will be interested to follow the developments in Western Sahara now and were pleased to have made that journey during a time of stability. The night was disturbed by grunting from the lake. 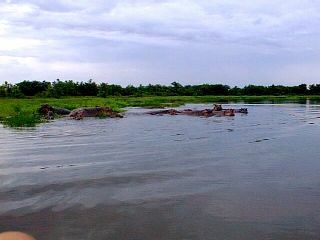 It was a group of local hippos having a shindig. Thank goodness we have a roof tent. 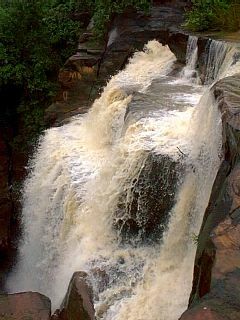 In the morning we visited the impressive Chutes de Karfiguela via an interesting muddy road. In our "quart-quart" it was fine and we were soon assisting the two wheel drive vehicles out of the mud. At the next peage we struggled with our French before the chap said "oh, you speak English". Humpf. 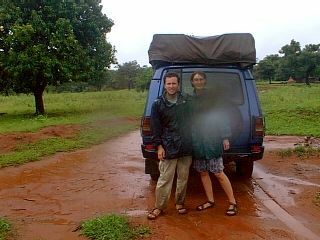 Arrived at Casa Africa in Bobo and parked in the space vacated by Noel and Sally who sadly had departed five hours earlier. We could tell they had been there by Turtles tracks and by the large collection of onion and potato skins lying on the top of the bin. Campsites are only really good for one thing and that is water - for a shower, to wash clothes and to fill the tanks. Otherwise they are noisy places and are regularly visited by people with deformities of some sort to try to get money out of tourists. It is really difficult to say no but we manage it every time! The loos are always horrible too - I'd much rather squat behind a bush. 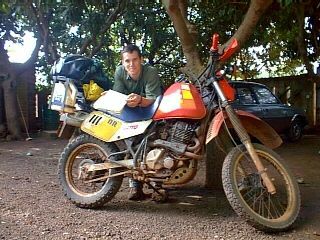 Spent the evening talking with Matthew from Pensylvania who is touring Africa on his motorbike having recently finished a two year stint with the Peace Corps (US equivalent to VSO). Had very little sleep that night so we had a lazy next day and couldn't be bothered to move on. After I had cooked dinner Andrew informed me of Steak au Poivre and chips on the menu. Oh, my favourite so we had two dinners that night. The steak was fantastic. Afterwards I got out the tape measure and despite having two dinners there were reductions in all areas measured. Oh yes, what a good day. Andrew has less "pneus" and is a number of notches smaller on his belt. (No further clues for purposes of the sweepstake!) We joined Stefan and Katrina from Austria for the evening to hear a local band play their drums. 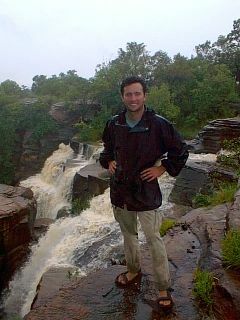 It turned out to be a very touristic affair - not quite the true African experience we had hoped for. The next day Punda had a bit of surgery - some welding. Oh dear, the cracks are starting. 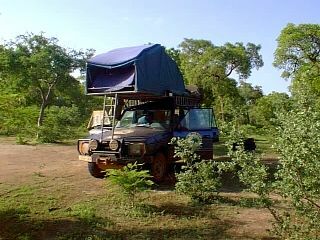 It is a shame that aluminium roof racks weren't available when our steel one was made. After about 40 kms down a bad piste and then 20 km down an even worse piste we reached the Mare aux Hippopotames (hippo pond). It is actually a very large lake with no edges. You have to be careful not to drive off the swampy piste straight into it. 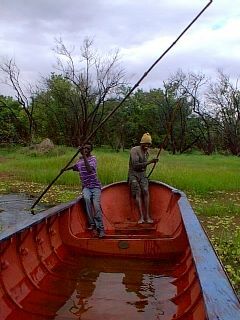 We stopped the car when the water level reached about 5cm then walked to knee depth before getting into a pirogue with a couple of fishermen for a cracking experience - one of the best yet. After half an hour of being punted along the lake using bamboo poles we spied huge grey rock-like formations at the lakeside. At a distance of about ten metres the rocks "woke up". Wow, what a sight. 23 hippos dashed for deeper water. It was incredible. We stayed for about half an hour - us watching them and them watching us. We were at spitting distance away from one of Africas most dangerous animals and it was so exciting. In fact, with all the excitement I fell over in the boat. This was an experience not to be missed, particularly at a price of two pounds each! We were also delighted at Pundas recent performance - over 30mpg on two separate occasions. The road to Dedougou was reasonably good for a gravel road. We passed cows with humps (initially thought they were deformed ones), villages that look like toilet blocks given their square box shaped houses with little windows near the top and storage huts on stilts. 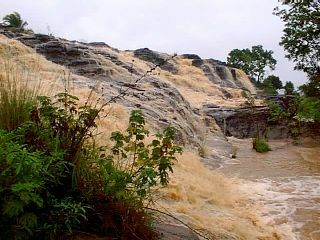 The surroundings in this country are so different from Cote d'Ivoire. You can tell when one is going north by the distinctive Arabic influences. The locals loose their full faced black complexions as the coarse skinny and lighter features of Arabic types become commonplace. The mosques are beautiful - the Sahelian type that look like termite mounds. We found huge mangoes for 3p and treated ourselves to tuna mayo sandwiches - almost as good as bacon butties. It is amazing how things that we commonly have at home become such a treat out here. We gave a man a lift into town as his lorry had broken down. The problem with giving a local a lift is that they always leave something behind. So far: oily handprints, fag-ash burn in the carpet, muddy footprints, a shirt, a pineapple, a letter and always, always, always a bad smell! After a night of solitude whilst bush camping we awoke to intense heat. Phew - we we going towards the desert. Continued along the road towards Mali along the "dangerous" route according to the Michelin map. Well yes, it was interesting and we passed a lorry at 45 degrees but Wonder Punda took it all. The last 30 km along this route in the north of Burkina is absolutely beautiful. The greenery is more dense which was a bit odd as we headed towards the desert. Also the terrain becomes rocky and therefore much more scenic than the savannah that we had been looking at during the last week. It was when we stopped to look at the scenery that we noticed one of the suspension rubbers missing. Border formalities would have been quick if Andrew hadn't decided to have a two hour conversation with the border guards. Eventually we entered no-mans land en route to Mali for a bit of Dogon country before returning to Burkina for onward travels south. It takes ages to prepare but cooks really quickly. Cook onions & garlic in oil until soft. Add dish 1 ingredients & stir for 30 seconds. Add dish 2 ingredients (it will hiss) & stir for about 10 seconds. Add dish 3 ingredients with about 200mls of water. Boil then simmer for 20 minutes. That is it! Banks tend not to take Mastercard but accept Visa for cash advances. There is not really an awful lot to do here but if you have a multiple entry visa you can nip in and out to Mali, Benin, Togo, Ghana, Niger & Cote d'Ivoire. Casserole dishes commonly used throughout West Africa are large aluminium pots placed directly over hot coals. They are known as "marmites" - the French word for casserole. It is the same shape as the dish on the front of the marmite jar.